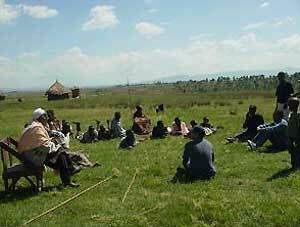 Following the session on October 20–23, 2003 of the International Field Station Cooperative Workshop in Ethiopia, a study tour was organized to various parts of the country. ASAFAS graduate students engaged in research in Ethiopia acted as facilitators, guiding the participants to the respective fields (Arsii, Gondaar, Jinka or Mago). Many of the participants of the workshop, including myself had never been to Ethiopia, and the tour therefore aroused great curiosity and ultimately gave us valuable knowledge that will be useful in our respective studies. The following is a report on the Arsii tour that I joined, including my reflections and thoughts. cut the tef just above the root. Tef (Eragrostis tef) is a type of lovegrass (gramineous plant) that originates from Ethiopia. The grain is extremely small, with a diameter of only about 0.5 mm, but it is extremely important to the people of Ethiopia, since injera, the local people’s staple food, is made of it. 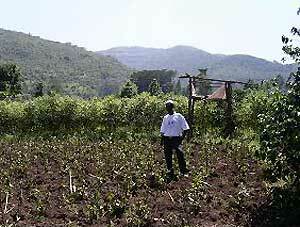 On the first day, we visited the Great Rift Valley near Nazret to see this tef cultivation. In late October, soon after the end of the rainy season, golden-colored ripe tef fields stretched out endlessly (Photo 1). 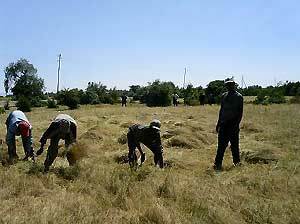 Our visit coincided with the harvest season, and people were reaping (Photo 2) and thrashing the crop. The thrashing was particularly impressive and unique. The harvested tef was all densely laid out on the ground, and then tread upon by more than five cattle (Photo 3). The cattle, which were tied to each other, circled over the tef many times and the seeds were trodden upon by the cows and gradually separated from the ears. The cattle worked remarkably well together as they trodded on the tef. I wondered how much training was needed for the cows to get such surprising coordination. Cattle seem to play an important role in other aspects of tef cultivation as well. They are used to till the soil prior to sowing by pulling harrows, and they also contribute to the maintenance of soil fertility. One villager, who uses almost all of his land to grow tef every year, brings a herd of cattle into the field after the harvest as a measure to maintain the soil fertility. 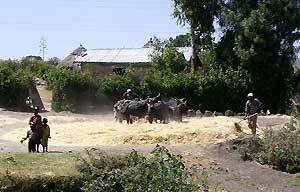 The cattle eat the remaining tef after the harvest and their dung helps to maintain soil fertility. This example shows that tef cultivation and cattle feeding are in a mutually supportive relationship. It seemed to me that the people are making their production more stable by combining two different activities on the same land. I was watching tef field from the car window and was surprised by a discovery. 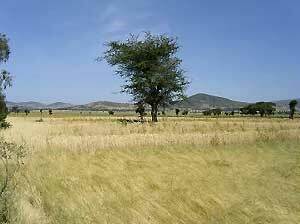 The field was dotted with trees, which are mostly Acacia albida (syn: Faidherbia albida), a tall leguminous tree (the trees in Photo 1, hereafter albida). Serer pastoral farmers that I am studying and who live in the savanna in Senegal, Western Africa, have developed artificial vegetation dominated by albida in their farmland, while engaging in the growing of pearl millet and cattle breeding. Albida, which has a very unique phenology in that it loses its leaves in the rainy season, while growing them in the dry season, helps the pearl millet to grow well in the rainy season and provides cattle with valuable feed during the long dry season. The Serer people, by allocating a lot of albida trees in the farmland, have positioned the three actors of pearl millet、cows and albida in a relationship of coexistence, thereby creating a sustainable livelihood. It is very interesting that albida can also be found in tef fields. They are obviously kept intentionally. For what purpose do the Arsii people keep albida? Is there any triangular relationship among tef, cattle and albida, as is seen in the Serer community? I do not have an answer to this question yet, but by comparing the Serer and the Arsii people from the viewpoint of these triangular relationships, we may be able to gain a broader understanding of the livelihood conducted in acacia savanna. On the second day, we moved to Wendo Genet, a hilly area. The name of the area means “paradise of men,” and apparently derives from the fact that the land in this area is fertile and has abundant water. Looking at Wendo Genet from the distance (Photo 4), we saw the settlements of Sidama people in the far-away mountain and opposite it, the settlements of Arsii people on the slope in the foreground of the bottom of the valley. We were told that the Sidama grow many cash crops and depend heavily on the cash economy, whereas the Arsii continue their subsistence livelihood based primarily on the cultivation of staple crops and animal feeding. The difference between their livelihoods seems to be reflected in their choice of roof materials. 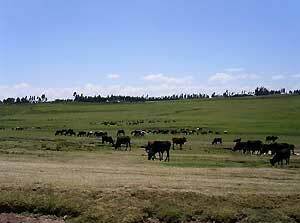 The Sidama use galvanized sheet, whereas the Arsii use grass. 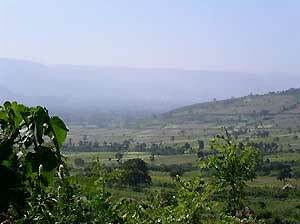 The valley bottom is also inhabited by Amhara and Gurage, as well as Sidama and Arsii people. We visited a Sidama farmer and learned that khat (Catha edulis), coffeee, and fruit trees were being grown as cash crops, with ensete (Ensete ventricosum) and maize being raised as staple foods. Coffee can be consumed at home, and in this case, it is “processed” on the street. The coffee beans are spread out on the street, and horse carriages or cars that pass by help break the hard coffee hulls. The people put this bold idea into practice without a hitch. We saw cattle grazing on relatively steep slopes. 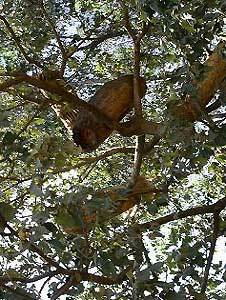 In addition, we saw a beehive (a hollowed log) in the crown of a tree in the garden (Photo 5). Honey can be sold for brewing at about 200 birrs (about 25 US dollars) per hive. The people manage their livelihood by combining many activities together, using access to the diverse ecological resources. One cash crop cultivated with particular enthusiasm in the Sidama village is khat (Catha edulis), an evergreen broad-leaf tree in the staff vine (Celastraceae) family (Photo 6). Its leaves have stimulant properties, and have long been chewed by Muslim. In recent years, it has even spread among Christians, who did not chew it in the past. We were told that coupled with the stagnation in prices of coffee, which is Ethiopia’s major export product, the khat market is thriving in the country. In one farmhouse, we saw a khat field where seedlings had just been planted. The harvesting takes place at least two years after planting. In order to earn an annual income on a continuous basis, the farmer was mixing trees of different ages (Photo 7). The harvested foliage is sold on the neighboring market in the early morning. Since khat is an evergreen plant, the market is open throughout the year. Most of the crop is transported to nearby cities. The khat variety that can be sold at a high price in this area is called beleche, which sells at a retail price as high as 15 birrs per bunch (equivalent to the price of a pack of Marlboros). 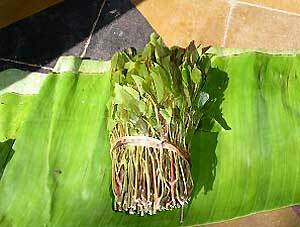 Khat appears to be a promising product that brings cash to people. On the third day of the tour, we visited Ashoka Village in Kofele District located 70 km east of Awasa. The village is located in the cool highland, at 2,400 meters above sea level. Traditionally, the village’s livelihood has been based primarily on cattle grazing (Photo 8). However, one village elder told us that the situation surrounding cattle grazing has changed in recent years. When he was young, the village maintained its livelihood with cattle grazing alone. But starting in 1991, when Ethiopia’s economic system was radically changed, agriculture began to spread rapidly and now cabbage and barley are grown on a considerable land area. On the other hand, grazing land has been cut back as a result of the land cultivation and it is becoming increasingly difficult to continue cattle grazing as was done in the past. People say that the agricultural guidance carried out by the government emphasizing productivity, as well as the transformation of the economic system and increasing population, have profound relevance to the changes in cattle breeding. The guidance, as I understand it, encourages a decrease in the number of cows by changing the cows from an indigenous breed to a more productive improved breed, with the conversion of the saved grazing land to farming land. The objective is probably to increase overall productivity of the land through a qualitative improvement of cows and a resulting agricultural expansion. The villagers told us about some problems involved in this change (Photo 9). Their foremost concern was that there would be a greater chance for a smaller number of cattle, no matter how productive they were, to be wiped out by infectious diseases, for example. Having more cattle allowed them to avoid this risk. They also pointed out that a smaller number of animals would make it difficult to pay dowries, etc. In Africa, there are many areas where cattle are given as gifts or exchanged on various occasions, as indicated by the fact that they are used as dowries. Exchanges using cattle play an important role in maintaining social relationships. A smaller number of cattle would pose a serious problem, as the animals owned by the people are deeply related to their society and to the culture of the community. The government’s guidance, which only emphasizes productivity, seems reasonable at first glance, but it fails to take into account the role of cattle in the community. I really hope that the area study we are carrying out will be able to contribute to overcoming the problems of the community based on the viewpoint of the local people who are actually facing the problems. The Arsii tour was an extremely satisfying experience. The visit to the Great Rift Valley gave me the opportunity to think about comparative area studies. In Ashoka Village, the people were quite willing to tell us about the current situation of the village, and also gave us an opportunity for a dialogue on the problems the community is facing. These are indeed valuable experiences that can only be attained in the field. The discussions we had among the members during the tour were so valuable that I would have liked to record them, though I have not included them in this report. Among others, Mr. DEMEWOZU, who spoke with great enthusiasm on the importance of the theory framework, gave me great inspiration in writing my doctoral dissertation. Mamo Hebo, the facilitator, gave us wide-ranging information about the area based on his research findings. In addition, he took such great care to ensure that our tour proceeded smoothly. I would like to thank Mamo and all the other members of the tour from the bottom of my heart.